Heres a superb online slots casino game from NextGen gaming. 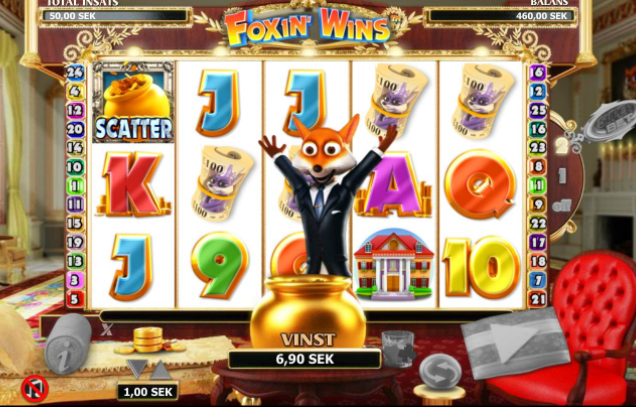 The wily slots player chooses only the classiest online games, and Foxin’ Wins is sure to be on their favourites list when playing. Foxes are often associated with intelligence, smart schemes (think Roald Dahl’s Fantastic Mr. Fox) and coming out ‘on top’. Reynard the Fox, a character from old French fable, always outsmarted the other creatures in the forest and emerged triumphant. And on a grimmer note, in the classic tale ‘Henny Penny’, Foxy Loxy uses his smarts to lure a band of animals to his lair and gobble them all up. Though Foxin’ Wins features a kindlier fox than that from ‘Henny Penny’, this fox has certainly made a comfortable life for himself. He’s a classy chap, and you’ll feel surrounded in an atmosphere of opulence as you spin the reels on his latest slot games. Though their repertoire is varied, NextGen’s speciality is ‘creature features’, and they are experts in creating eye-catching creature characters as appealing mascots for their games, and using animal themes to clever effect to bring games alive through design and game mechanics. Don't miss out available UK casino bonuses when you play the game! Mr. Fox has invited us into his living room, and he’s clearly basking in the lap of luxury. The background to the reels is an extravagantly-furnished room in what looks to be a mansion, with a divan and a leather upholstered chair in the foreground, and in the background, expensive-looking soft furnishings, glowing candles and an enormous, gold framed portrait of the resident fox himself. We press a tasteful striped cushion to spin the five reels, and each spin is accompanied by a jaunty little brass tune, of which there are several variations, to keep things fresh. The symbols all suit the opulent setting, and amongst these are rolls of banknotes, golden fountains with St. Valentine-style posed fox statues in the centre, and a foxy lady (perhaps the love interest) driving a posh red sports car. WILD FOX PUPS – in a clever twist on the typical WILD symbol format, in Foxin’ Wins, fox pups hide behind the reels, and can pop out and turn symbols wild. These WILDS are linked with the SUPER BET feature. SUPER BET – you can set this additional wager feature to one of three levels. 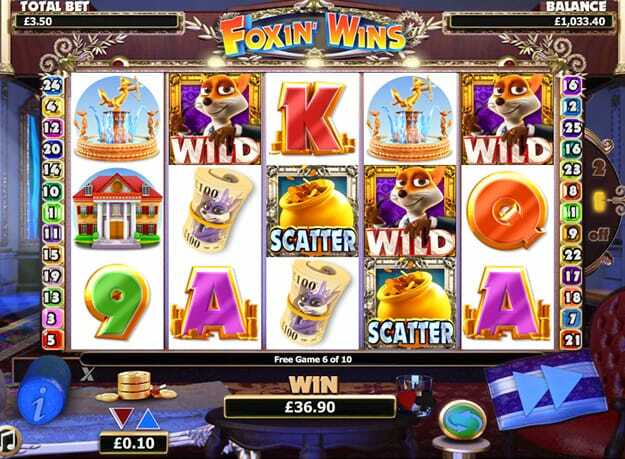 The first is ‘off’, which allows you to bet 25 coins for a fox pup in reel 3. 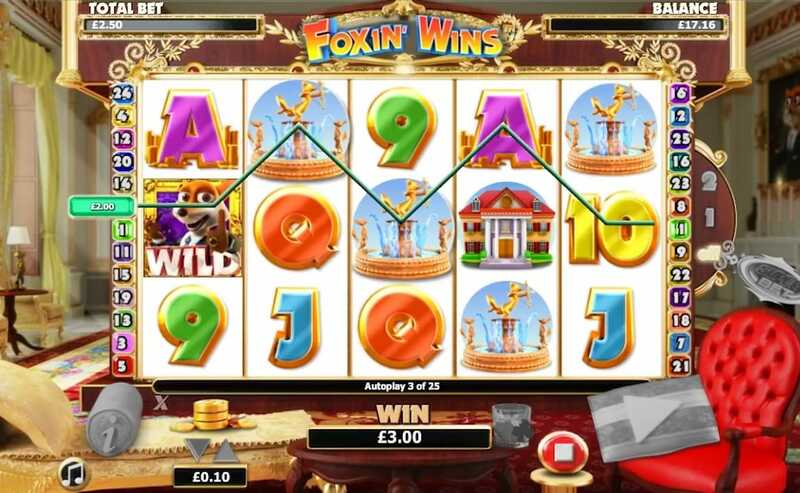 The second is Super Bet 1, to bet 35 coins for fox pups in reels 2, 3 and 4, and the highest level is Super Bet 3, with a bet of 50 coins for pups in all reels. Add more fox pups to increase your winning chances! SCATTERS – if 3 or more golden pot SCATTER symbols appear on the reels, you’ll get 10 free spins with doubled prize amounts. SCATTER wins will be multiplied by the total amount staked, though this excludes Super Bets. During free spins, there’s an increased chance of fox pups appearing, which adds to the excitement and can lead to great winning streaks. FOX FUNDS – it’s always nice to receive a gift from a generous benefactor, and occasionally the fox will top up your balance, out of the goodness of his foxy heart. LEPRECHAUN SHAKE-DOWN – once in a while, a mischievous leprechaun will invade the gaming screen (no doubt having escaped from NextGen’s title ‘Emerald Isle’). If you shake him down, you’ll dislodge some extra gold to add to your pot. GAMBLE – you have the option to gamble your wins, which will then present you with a choice of card colour and suit. Choose the correct colour to double your win, and the correct suit to quadruple the win. Choose wisely, though, or you may walk away empty-handed! The golden SCATTER pots animate, as do the WILDS, and the adorable little fox pups, when they appear, add a cute element of humour as they playfully spin the symbols to turn them WILD. The Gamble feature is simple to use, and is a nice addition for those seeking a bit more tension in their game, or playing for larger wins. With so many features, it’s extremely useful that they’re all clearly outlined, along with paylines, symbols and general game rules, in the ‘information’ function accessed by clicking on the divan cushion. Everything about Foxin’ Wins screams ‘cool, classy and classic’. NextGen delivers a game that’s as stylish and charismatic as its foxy title character. As you can tell from the myriad bonus features, this is a fast-paced, fun-packed game with high entertainment value, and there’s never any chance of becoming bored mid-game. In fact, there’s so much vibrant content that even when you activate the Autoplay feature, you feel constantly entertained and involved. All-in-all, this is a crafty, colourful, and comical slots experience, and one that bears exploring fully to take advantage of its lavish content. You’d be wise to give this one a spin. If you enjoyed Foxin' Wins then you might also like Starburst.